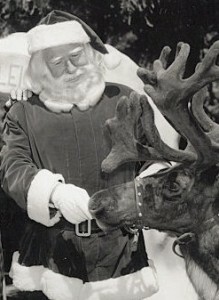 Carl Hansen, a native of Denmark, was the official “Santa Trainer” for Santa’s Village Corporation’s three theme parks in the 1950s and 1960s. As Santa, Hansen opened up the Skyforest, California Santa’s Village in 1955 and the Scotts Valley, California’s version in 1957. He also trained the Santas for the Dundee, Illinois Park. Hansen is credited with creating a year round persona that was original and is still used today. Most children of the day only saw Santa in a department store, but at Santa’s Village, Hansen was seen in Santa’s House, in the reindeer barn, in the Candy Kitchen with Mrs. Claus, and in the Mill Wheel Workshop building toys. Hansen used the props available to create a startling realism to the role.